Liberty’s Benjamin Flees (55) brings down Westerville Central quarterback Labronz Davis during the second half of Friday’s league game in Powell. Olentangy Liberty quarterback Mitchell Okuley ran for a couple touchdowns, the second giving his team a late 16-7 lead it parlayed into a 16-14 OCC win over visiting Westerville Central Friday in Powell. Okuley’s first TD, a two-yard run with 4:26 left in the first quarter, accounted for the only points of the first half. Westerville Central answered with a 33-yard scoring strike from quarterback Labronz Davis to Colton Irwin at the 6:31 mark of the third quarter, but Mitchell Kershner nailed a 39-yard field goal with 4:54 left in the third before Okuley’s fourth-quarter score gave Liberty some breathing room. Central smoothed out the scoring summary with a 75-yard strike from Davis to Kylin Byrd with 5:17 to play. The TD made it a two-point game, but that was as close as it would get. Jahi Broussard-Nash ran for 222 yards and two touchdowns to help the Pacers pull away for a convincing OCC win over the visiting Wolves Friday night in Delaware. He broke the scoring seal with a 50-yard touchdown run with 3:13 left in the first quarter. He punctuated the win, too, capping things with another long scoring run, this time from 53 yards out, with 5:53 to play in the fourth. 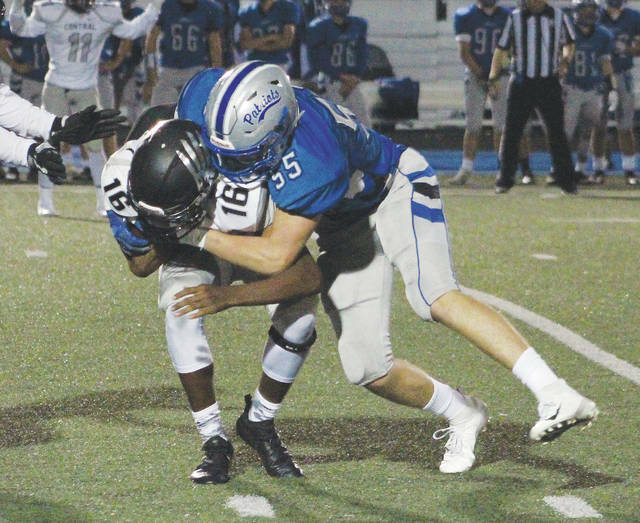 Kilbourne stayed within striking distance throughout the first half, getting its deficit to four, 7-3, when Joey Laudermilch booted a 26-yard field goal less than a minute before halftime. The Pacers didn’t allow another point the rest of the way, though. They extended their lead to 14-3 when Blake Eiland scored on a five-yard run with 9:52 left in the third and made it 17-3 when Kyle Klumpp connected on a 26-yard field goal of his own late in the quarter. Broussard-Nash and the defense took care of the rest. Hayes allowed just 205 yards of total offense, all while collecting 457 of its own. The Barons used a big second half to get the job done, outscoring host Ontario 16-6 to nab a solid league win on the road Friday night. Grant Owens threw the ball a lot, 33 times to be exact, for 201 yards. More than half of those came in the third quarter. Beau Ewing was his top target with nine grabs. Zach Garber did his part as well, rushing for 123 yards and two key touchdowns in the win. His first — a three-yarder with 42 seconds left in the third — gave BV its first lead at 12-10. His second — a 73-yard sprint to the end zone with 10:58 left in the game — gave the Barons all the insurance they would need. Buckeye Valley got solid defense and special-team play, too. The defense held Ontario to just 30 yards of total offense in the second half while Felipe Scharff converted a couple field goals in the win, kicks from 40 and 32 yards out. The Braves trailed 10-7 at the half, but outscored the visiting Wildcats 14-0 in the second half to notch a win in their league opener Friday in Lewis Center. Olentangy’s Zach Shiblaq, who finished with 165 yards rushing on 22 attempts, powered into the end zone from a yard out for the go-ahead score with 7:43 left in the third. The Pioneers raced out to a 34-0 halftime lead and rolled to an OCC win over the host Warriors Friday in Westerville. Robbie Dayhuff completed six of his 11 passes for 67 yards and a couple touchdowns. Mark Roberts, meanwhile, ran for 146 yards and a score in the win. The Bears put together a solid first half, rolling out to a 21-7 lead by halftime, but the Panthers got the final say in Friday’s OCC showdown at Berlin. Berlin’s Jacob Moeller had a hand in a pair of first-half touchdowns. He capped a 43-yard drive with a one-yard TD run with 3:56 left in the first and, after a Darby touchdown evened things up, made it 14-7 with a 39-yard scoring strike to Ethan Lee. Johnny Spinner bumped the lead to 21-7 with a one-yard run less than a minute before the break. The Panthers, though, took charge in the second half. They outscored the Bears 21-0 in the final two quarters — including a six-yard touchdown run by Eric Williams with 26 seconds to play — to account for the final margin. https://www.delgazette.com/wp-content/uploads/sites/40/2018/09/web1_lib55-1.jpgLiberty’s Benjamin Flees (55) brings down Westerville Central quarterback Labronz Davis during the second half of Friday’s league game in Powell.